Please enjoy our photographs. They were taken during the summer of nineteen ninety eight during our first European family vacation. Wales is an incredible country with a multitude of castles and historic sites going back hundreds and thousands of years. Castles are in every town and village. The Welsh people are friendly and we enjoyed their hospitality. 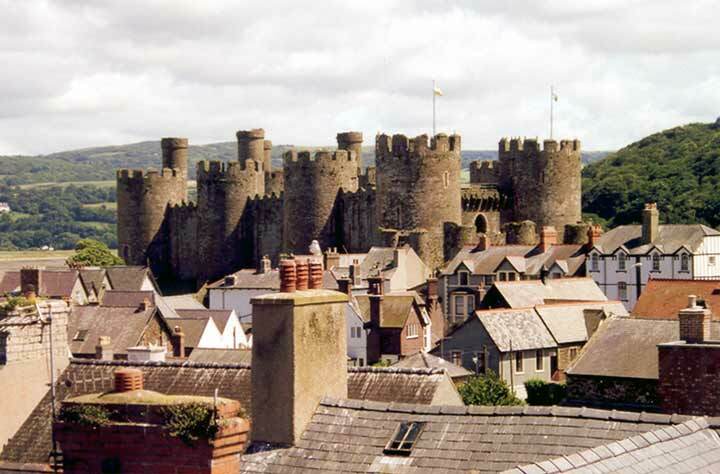 Conwy Castle is one of the castles built under the rule of Edward the First. The first time my new bride, Aimee, and I visited Conwy Castle, we traveled down the Conwy River Valley in a northernly direction from the town of Betws-y-Coed : the scenery was spectacular. Conwy is among a ring of castles and towns that King Edward the First had constructed around North Wales to maintain Norman rule of Wales. Both the castle and the town walls are well-preserved.